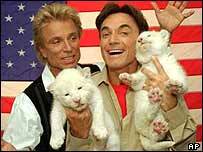 Illusionist Roy Horn, half of the superstar duo Siegfried and Roy, remains in a critical but stable condition after being mauled by a tiger during a live performance at a Las Vegas casino, his spokesman said. The magician, who suffered a serious wound to his neck on Friday night when the animal lunged at him at The Mirage Hotel and dragged him off stage, has undergone emergency surgery at the University Medical Centre. "The doctors are encouraged that he will recover, but it will be several days until the full extent of his injury is known," Mr Horn's spokesman, David Kirvin, told the Associated Press news agency. Alongside partner Siegfried Fischbacher, Mr Horn has performed in Las Vegas for more than 30 years, gaining worldwide celebrity for a magic show involving exotic animals, most famously, white tigers. About 45 minutes into Friday show, Mr Horn had appeared alone on the stage with a seven-year-old tiger called Montecore, telling the audience it was the animal's first performance, witness Andy Cushman said. The cat then suddenly lunged at Mr Horn, who turned 59 that day, grabbing him by the left side of the neck. The magician responded by trying unsuccessfully to beat the tiger off with his microphone, shouting "No, no". Backstage staff rushed to try to rescue Mr Horn, but were unable to help. When the tapping on the animal's nose failed, Mr Horn tried to wedge the microphone into the tiger's mouth to force its jaws apart. But this was unsuccessful too and the magician dropped to the floor and was dragged off stage by the animal. Many audience members seated close to the stage were said to have been extremely frightened by the incident. Some, however believed initially it was part of the act. The German-born pair have been performing at the Mirage since 1990, doing six shows a week, for 44 weeks of the year. In 2001 they signed a lifetime contract to continue performing at the hotel. Big cats, most notably the white tigers with which they have become synonymous, have been an integral part of Siegfried and Roy's act since they began performing together in 1959. There had been no previous attacks in more than 5,000 shows performed by the pair, show stage manager Bernie Yuman told Reuters news agency. Montecore, the tiger involved in Friday's incident, has been put into quarantine. "Lions and tigers have been an integral part of their act"